Richmond is brimming with immersive free and wallet-friendly experiences. It’s possible to have an amazing time in Richmond with an itinerary full of free experiences and excursions. This is especially true if you’re visiting with your family, as many of these experiences are both kid- and adult-friendly. Remember, some places appreciate donations, so if you enjoy the time you spend there, please consider giving to help with upkeep and programming. Breathtaking Minoru Park and the nearby Richmond Cultural Centre, Richmond Art Gallery, and Richmond Museum are all free to visit, and close to many hotels. They’re always switching up their exhibits and hosting free events throughout the year, so be sure to check out our events page regularly! Also free to visit is the International Buddhist Temple, the second-largest Buddhist temple in North America. It will captivate you with golden statues, ornamental fountains, and beautiful gardens. It’s perfect for a tranquil escape from the city. Britannia Shipyards National Historic Site features turn-of-the-century cannery residences, a shipyard, boardwalk, marsh, and more. From there, London Heritage Farm is just a short distance away. 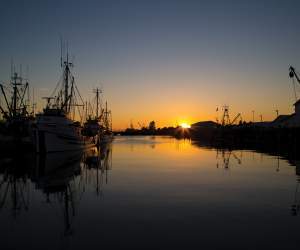 Spend some time exploring this four-acre historic site and heritage garden that aims to recreate life in Steveston from 1880 to 1930. You can also enjoy picturesque high tea and fresh-baked pastries for just $15 per person, giving an excellent opportunity to enjoy your company in beautiful surroundings. Stop by the Steveston Museum and Visitor Centre as well, where you can explore the Japanese Fishermen’s Benevolent Society Building and learn about Steveston’s Japanese Canadian (Nikkei) community. Just down the street is the Steveston Interurban Tram on Moncton Street. Tramcar 1220 is now the largest artifact in the Richmond Museum’s collection, and is one of the only remaining interurban trams once operated by the BC Electric Railway Company. Richmond is a very walkable city with agreeable terrain and an extensive trail system. Over 80 kilometres (50 miles) of trail await your discovery, with many being perfect for an easy walk or relaxing bike ride. Many trails also wind through Richmond’s sprawling system of over 100 parks. While on foot, check out Richmond’s public art installations by local and international artists, many reflecting Richmond’s culture and heritage. The Richmond Nature Park is the perfect refuge for nature lovers. 200 acres (81 hectares) of raised peat bog habitat await, along with 5 kilometers (3 miles) of walking trails through the bog, forest, and pond habitats. Check out the Nature House while you’re there—an interpretive centre featuring displays about the park, games, activity kits, and even an active beehive. If you’re with your kids, bring them to the Terra Nova Adventure Play Environment. This dynamic, million-dollar playground features innovative structures designed to reconnect kids with nature. In addition to striking natural elements, the park features a seasonal meadow maze, a hillside slide, tandem ziplines, an aerial rope walkway, and much more. It was awarded a design citation from the Canadian Society of Landscape Architects in 2015. Check out our events calendar and our blog regularly. There’s always something fun—and free—going on in Richmond.